Grease the molds or use cupcake liners. Combine the flour, salt, baking powder and baking soda in a large bowl. Use another bowl to mix the sugar, honey, eggs, yogurt, melted butter and lemon zest. Stir well. Add the dry ingredients and briefly stir with a spatula. Stir only a few times because it should still be lumpy. Pour the dough into the molds. Fill 2/3 of the each mold. For the Streusel: Combine the butter, sugar and Fiber One™ Protein in a small bowl. 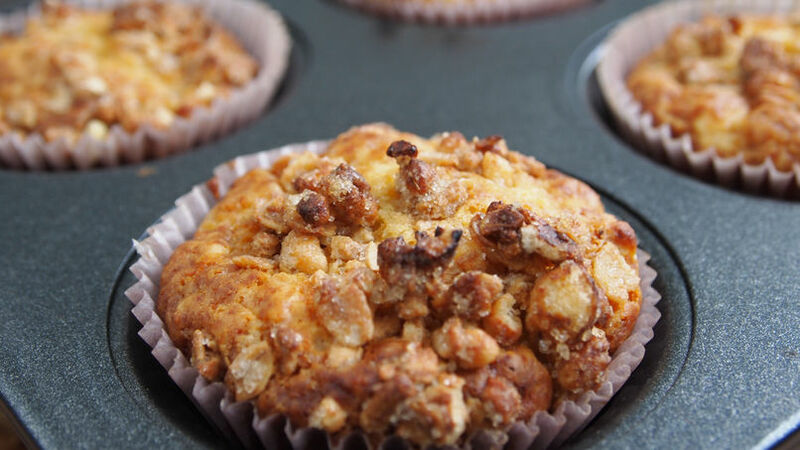 Pour one tablespoon onto each muffin and bake for 15 minutes or until they have lightly browned. If you insert a toothpick in the middle of each muffin and it comes out clean, they are ready. Serve warm on the same day you made them. If you want to add variety to the flavor, add 1/2 cup of dry cherries or blueberries to the dough. Add 1 teaspoon of cinnamon to the Fiber One™ Protein when you prepare the streusel. Instead of lemon zest, you can use orange zest. The first time I made muffins, I was surprised by how easy the process was. All you have to do is mix your dry ingredients in one bowl and your wet ingredients in another, and then mix the two with a spatula in just a few movements. The trick is to no beat or stir too much. The dough should be lumpy, as if it’s not well combined. Another thing to keep in mind is that your muffin dough can’t wait for your oven to ready. Preheat ahead of time so that as soon as you’re done filling the molds—always 2/3 full—you can place them in the oven. With this recipe, which includes a Fiber One™ Protein topping, they’ll be ready in just 15 minutes. Muffins are best enjoyed fresh out of the oven, but you can freeze the ones you have left. You can let them thaw and heat them in a warm oven for a few minutes. Normally they don’t last long, which is why it’s best to eat them fresh. These ones make a great option for a picnic or your kids’ lunchboxes. Enjoy!